MICROSCOPY UK / MICSCAPE - Image of the month, sulphur, polarised light. The picture was taken using a flash, planapo 10x objective and Ektachrome 50 slide film. (As you may know an apo tends to give a visual image with grey-black, rather than jet black background because of internal birefringence). Therefore, the "literature" wisely recommends achromat objectives for polarized light microscopy. However, I have found that Ektachrome, and other colour film, records the background as jet black anyway, apparently because film is not as capable as the eye in separating slight differences in contrast. Needless to say the apo yields images with better definition and more intense colour then an achromat. For this reason I recommend them for "artistic" polarized light photomicrography, where impact, rather then accurate colour renditions, is the goal. Editor's Note: The wonderful effects created when observing crystals under cross polarised light is relatively easy for the amateur to achieve. Two articles for the novice - Technicolour Nature , explain the technique and can be found in the Micscape Article Library. 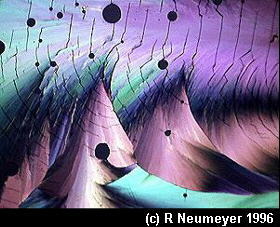 The Micscape and Microscopy UK Editors thank Ron Neumeyer for submitting this month's Image of the Month. Comments to the author Comments to the author sent via our contacts page quoting page url plus : ('rneumeyer','')">Ron Neumeyer welcomed.